We were going to my cousin’s for a Saturday night pot luck sort of meal at the weekend. I, as you might expect, made dessert. As were are still clinging onto the last gasps of summer, I wanted to make a sunny cake. Something light and delicious and fruity. And to me that spelled out peaches and lemon! Don’t know why, but peaches and lemons conjure up sunniness and freshness, so off to the supermarket I popped for some. However I didn't go near the fresh fruit section, I got myself some canned peaches and some lemon extract. Cheating, I know. I blended some peaches into a puree with my stick blender and folded this into the cake batter, adding some of the lemon extract. I baked this into two cake pans and when they were cooled, I split these into two, so I had four layers. I then made a peachy, lemony buttercream too. I added some of the peach juice from the can to the buttercream and some more lemon extract. I wanted to go for an ombre style icing effect, so coloured the buttercream into different shades, one batch natural, the others more yellowy and one pale orange. To get the effect, I put the coloured buttercream into disposable piping bags and piped the colours around before smoothing things off with a palette knife. Very simple, yet very effective. I did sugar some lemon peel, I had a lemon kicking about the kitchen, to garnish the top, But that was about it. Everyone loved the cake and my mum grumbled at my meagre portions – she went back for seconds. Always a good sign. Pre-heat the oven to 180C and grease and line two 9” round baking tins. Sift together the flour, cornflour, baking powder, bicarb and salt. In a separate bowl, cream together the butter and sugar until light and fluffy. Add the egg and beat this through, then add the lemon extract and beat this in too. Add the dry ingredient and stir until combined then lastly add the peach puree. Stir this through then divide the batter equally between the two pans. Bake in the centre of the oven for 25 to 30 minutes, until golden on top and a toothpick comes out clean from the centre. Allow to cool in the tins for 5 minutes before removing onto a cooling rack. Allow the cakes to cool completely and in the meantime make the buttercream by creaming together the 170 grams of butter, icing sugar, peach juice and lemon extract. Take one fifth of the buttercream and colour this pale orange and colour another fifth yellow. Split each layer of the cake into two and spread a layer of the uncoloured buttercream onto each, sandwiching them together. Spread a thin coating of the uncoloured buttercream all over the cake and refrigerate for an hour. After the hour, place the orange and yellow buttercreams into piping bags. Pipe these around the bottom and middle of the cake, Do the same for the top of the cake with the uncoloured buttercream. Go round the side of the cake with a palette knife, smoothing the buttercream. Clean the knife between each sweep of the cake. Refrigerate until ready to enjoy the cake. I have never made a peach cake, but I have no idea why, because it sounds amazing. Great addition of pureed peaches and I like that you have used tinned fruit for it. I virtually never use canned fruit or veg and always skip the isle in the supermarket. I think I probably underrate it..... but it is absolutely perfect for pureeing and I will have to make a mental note to consider it more in the future! Great recipe Stuart! 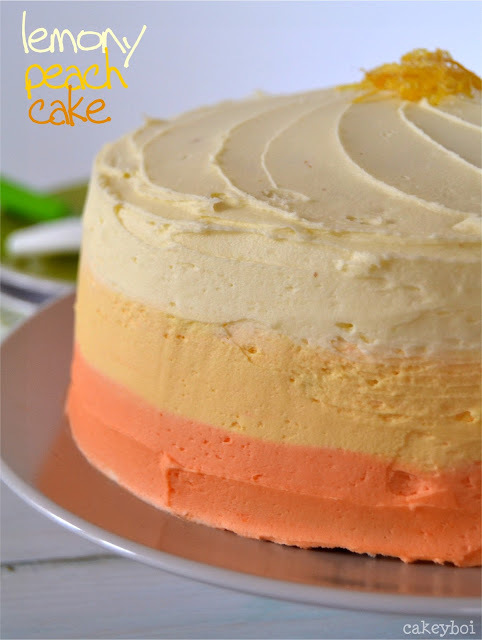 Looks so summery, I've never been brave enough to try ombré icing, so well done! It looks, erm, peachy! This looks really summery and delicious! Gorgeous cake. I like the idea of pureed peaches in the cake batter. Perfect for the time of year despite a current lack of sun. I'd definitely be in line for seconds. It may feel a bit like cheating but canned peaches do make a very fine and useful purée.